The water jug is an item which carries water and can be held in the players hot-bar or inventory. The water jug is far superior to the water bucket because of its extra 1,000 ml capacity and its ability to hold water while not in the hands of the user. 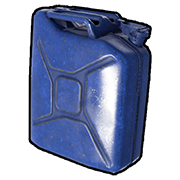 It is most commonly used in large numbers to carry massive amounts of water to a players base in one trip. It is highly recommended that you have multiple of these items if you plan to have any kind of indoor farm because of the water bonus to farming. The Water Jug is very usefull for when going to the launch site factory area because of the high raditaion of which water heal against. Left-clicking will throw out the contained water. Unlike the Small Water Bottle. To drink from it, click on the item and press "Drink Contents".